Your South Calgary Periodontist may recommend a regenerative procedure when the bone supporting your teeth as been destroyed or compromised due to extensive periodontal disease. These procedures can help reverse some of the damage done to your bone by regenerating lost bone and tissue. At South Calgary Periodontal, we have several different types of regenerative surgery that can be performed depending on your treatment needs. 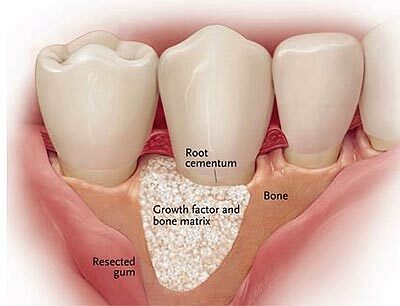 The first type of regenerative dental surgery is called ‘Bone Grafting‘. Based on the amount of bone loss around your teeth as a result of your periodontal disease, regeneration of some or all of your lost bone may be accomplished with bone grafting. 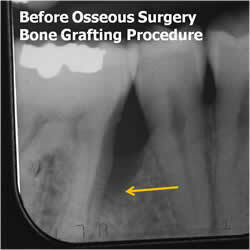 Bone Grafting is not as scary as it sounds. Basically, bone particle (synthetic, bovine, or human) that look like sand are mixed together with antibiotics. This mixture is then placed in the area where you have lost bone. Your body reacts as if you have broken a bone and naturally starts to heal the area, incorporating your own bone and regenerating some of the bone density you may have lost. In some cases, it is possible to recreate previously lost tissues. Depending on the level of periodontal disease and the pattern of tissue/bone destruction that has occurred, we can accomplish re-growth using ‘Guided Tissue Regeneration’. We accomplish this by using a number of bio-compatible materials (alone or in combination) that can aid in producing new bone and gum tissue. 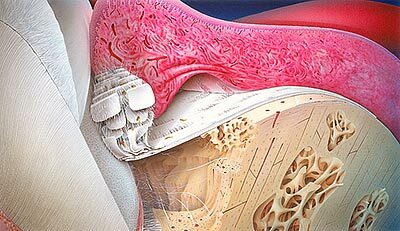 The goal of this technique is similar to that of Bone Grafting in that we are trying to create a bio-compatible membrane around the area of tooth damage, thus encouraging new bone to form. 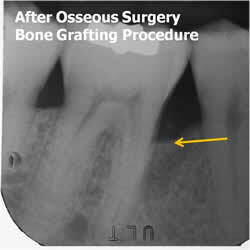 The procedure is normally performed along with Osseous Dental Surgery. This technique is normally performed along with Osseous Dental Surgery. In ‘Cell Stimulation’, we use an implantable protein material that stimulates a new attachment between the tooth and the surrounding bone. The ideal outcome in these kinds of treatments is the return of the tissues/bones to their original state, prior to the onset of periodontal disease. Depending on the type of periodontal disease, it is possible to use Regenerative Dental Surgery to recreate previously lost tissues. Your South Calgary Periodontist will be happy to discuss all of your treatment options with you and help you decide your path to oral health! Call us at (403) 278-5446 book your Regenerative Dental Surgery Consultation appointment today!